In my earlier posting, I wrote about one “rotten” morning I experienced. Now, let me share with you what a “weird or cuckoo” morning was like. AKS is a 57-year-old Indonesia. His problem started with a fever a few months ago. He went to a hospital in Jakarta for help. He was told nothing was wrong with him. AKS was not satisfied and consulted another doctor — an internist. Again he was told there was nothing wrong with him. Still not satisfied, he consulted a stomach specialist. He was told something was in his liver! AKS came to a private hospital in Penang for further consultation in February 2018. He saw one doctor and did an endoscopy. The result indicated esophageal varices, gastritis. Negative for Helicobacter pylori. Coarse liver parenchyma suggestive of underlying cirrhosis. Ill-defined mass in the right lobe of liver measuring 10.5 x 9.5 x 7.8 cm. Smaller lesions scattered in both lobes of liver ranging from 1.0 to 3.5 cm in size. Features suggestive of multicentric hepatoma. AKS was told to undergo a procedure called TACE (transarterial chemoembolization). He refused and went home to Jakarta. In March 2018, AKS came back to Penang again. This time, he consulted an oncologist in another hospital. His blood test showed deteriorating liver function. AKS was prescribed Lenvima (or Lenvatinib). For 20 days the drug cost him RM5,000. The doctor said this drug would not cure him! I asked AKS. The doctor did not ask you to take Nexavar? His reply, The doctor told me not to take Nexavar! AKS took Lenvima for two days and felt nauseous and dizzy (as before). He and his family decided to seek our help. AKS went to see two doctors. They couldn’t find anything wrong. The third doctor said there was something in this liver. Then he came to Penang and the first thing the doctor did was endoscopy! But there was something in his liver? Why endoscopy? Is this procedure just a matter of routine? More procedures better? Do you think all these make sense? Ask again, do you really need an endoscopy? As you can see, AKS went round and round, and only then a blood test and CT scan were done. Sure enough the results indicated tumours in his liver. AKS was asked to go for TACE. AKS refused. What is this treatment for? Can cure you? Prolong life? Improve quality of life? There is a 10.5 x 9.5 x 7.8 cm tumour in his liver. In addition, there are smaller lesions scattered in both lobes of the liver ranging from 1.0 to 3.5 cm in size. Do you think TACE can help the patient? In what way? Over the years, I have come across many patients who did TACE but did not benefit from this treatment. AKS was prescribed Lenvima (or Lenvatinib) for his liver cancer! I have never heard of this drug before! I told AKS usually doctors would ask patients to take Nexavar. This was when I got a shocking reply. The doctor told AKS not to take Nexavar! How could that be? What has happened? Does the doctor NOW know something about Nexavar that we all do not know? For the past two months, I have liver patients coming to me and they were taking Nexavar — why the change of “heart”? There must be a reason for this change from the standard practice. Let me say that those patients on Nexavar suffered severe side effects and gave up on the drug. That was why they came to us for help. I have written some cases about Nexavar and I am going to write more cases later. There was one lady who paid RM 20,000 for a month supply of Nexavar. She was told that when she comes the next month, she will get one month supply of Nexavar for free (promotion — buy one, free one). According to her son, after taking this drug for a week, she landed in the hospital and died. So the question is, why was AKS told not to take Nexavar now? It is because of such experiences above or something else? But more tragedy to come. Instead of Nexavar, AKS was described Lenvima or lenvatinib. I had to go into the net to find out what that is. Lenvima, a drug made by Eisai Inc. was approved by US – FDA for the treatment of locally recurrent or metastatic, progressive, radioactive iodine-refractory differentiated thyroid cancer. Lenvima is also used in combination with the drug everolimus, for the treatment of advanced renal cell carcinoma. There is a fine note which says: If a drug has been approved for one use, physicians may elect to use this same drug for other problems if they believe it may be helpful. Is this not what is happening now? Liver patients is given a drug for thyroid or kidney cancer? Its sounds like an “new experiment” on patients! Giving a chemo-drug that is approved for the treatment of thyroid or kidney cancer to liver cancer patient … to see what happen? I went cuckoo this morning! Oh, it is just a weird morning. My first time to learn such thing. Shah (not real name) is a 57-year-old Indonesian. He was diagnosed with liver cirrhosis in 2010. He came to a private hospital in Melaka and was prescribed Legalon or milk thistle. He did not take his medication seriously. His problem became more serious and in 2015 his problem developed into a full blown liver cancer or hepatoma. He was admitted to a hospital in Jakarta for treatment. He did TACE (transarterial chemoembolization) twice followed by four times of RFA (radiofrequency ablation). RFA cost him IDR 35 million each session. In addition Shah had to take the following 11 medications, one of which is Nexavar – a oral chemo-drug for his liver cancer. Listen to our conversation of what happened. Chris: Did the doctor tell you why he gave you Nexavar? Wife: To make sure that the cancer is under control. C: How long were you on Nexavar? W: Just about one week, and the supply was for a month. W: Disaster! (BadanNya hancur!) He gave up and did not want to take it anymore. C: Did the doctor say how long he has to take Nexavar? W: For as long as he lives! Now the doctor said take a rest first. After the side effects subside, continue with Nexavar again. C: What are the side effects? Wife and patient: Vomiting, loss of strength, giddy, fever, hard stools. C: How much did you pay for this drug? W: IDR 200 million per month. I am not sure if the figure, IDR 200 million for Nexavar, is correct. This is equivalent to RM 57,000 ringgit. The wife must have been confused. It could have been the total cost of his hospitalization, including other drugs as well. In Malaysia, Nexavar cost about RM 20,000 per month. Sometimes you get an offer: buy one, free one! That is you pay for the first one month, then you get free supply of the drug for the second month. One patient took this drug for a week and died. So she lost her deal for a free supply! Is this the first case of Nexavar giving problems to patients? No. Many patients told me similar stories of side effects. So, why do the doctors keep on prescribing Nexavar? Well, I really don’t know. Perhaps Nexavar is more “scientific” than herbs. If you don”t die from it, keep taking it — that’s the message given to Shah and his family. As I am writing this story, here is an email I received. I am writing to you with regards to my father, aged 82 years old. In December 2017, he was diagnosed with hepatocellular carcinoma (liver cancer). Tumor was approximately 7 cm in size. He has subsequently went for TACE early January 2018. The latest CT scan has showed that there is necrosis of the tumor. However, the APF reading this week shows a level of 2,000+. His hepatologist and us agree that we should take action to find a way to heal and hopefully, prevent the recurrence of tumor again. He has recommended that we think about Nexavar or seek alternative herbal treatment. My father has indicated that he would like to start on herbal treatments. I am wondering if you would be available to meet us next week? Think about it: His hepatologist recommended Nexavar or herbal treatment! What say you? Extensive Liver Cancer: TCM University Hospital prescribed chemo drugs! After three days patient gave up due to side effects! Henry (not real name) is a 58-year-old Indonesian. In 1994 he was diagnosed with Hepatitis B. He took herbs and was okay. But about three to four years later, a checkup showed the virus count has gone up high. He did nothing about it. In September 2017, Henry started to have bloated stomach. The doctor in Indonesia diagnosed it as gastritis. Later he went to the hospital and was told that he had liver cancer. He was prescribed some drugs. No satisfied, Henry went for further treatment in China in early January 2018. He ended up in a TCM (Traditional Chinese Medicine) University Hospital. A PET scan was done and the results showed the cancer had spread from the liver to his lung and lymph nodes around his neck. 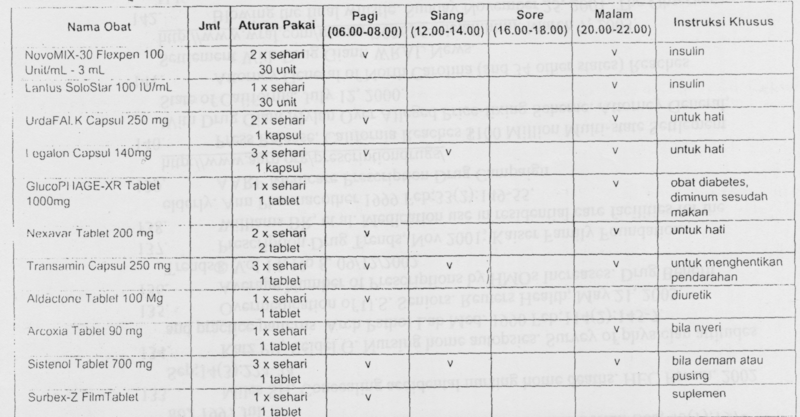 A two-day consultation together with the above medication cost IDR 50 million (approx. RM 15,000). The oncologist in this second hospital told Henry to go for chemotherapy. He refused and went home to Indonesia. What happened after taking the chemo-drugs? Listen to his conversation with us this morning. Chris: You took the three chemo-drugs that the doctor in TCM University hospital gave you. Then what happened? Patient: Not suitable for me! Just after three days, I had severe pain in my abdomen. This was after taking the Nexavar. P: Yes, after taking the first two drugs (Adefovir and Bicyclol). C: Then you gave up? P: Yes, we went to another hospital for blood test. C: Did the doctor prescribe any medication (after they know that the AFP was 275,330.70)? P: No medication. He asked me to go for chemotherapy. I refused and returned home to Indonesia. It is not difficult in this information age to know what the drugs prescribed by your doctor would do to you. What you need to do is read or have the desire to “know”. The problem with most patients is they don’t want to know! They believe that doctors know best. These are what I got from the internet. This drug is used to treat a chronic viral infection of the liver (hepatitis B) in people 12 years of age and older. It is not a cure for hepatitis B and does not prevent the passing of hepatitis B to others. This is a novel, drug derived from Fructus Schisandrae (Wu Wei Zi), a Chinese herb for treating hepatitis B and C.
kidney cancer that has spread outside the kidney and who are no longer being helped by other treatments. 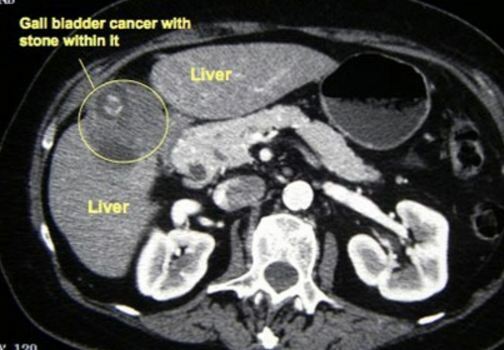 liver cancer that can’t be removed with surgery. thyroid cancer that is no longer being controlled by radioactive iodine treatment. Hand – foot syndrome (Palmar-plantar erythrodysesthesia or PPE) – skin rash, swelling, redness, pain and/or peeling of the skin on the palms of hands and soles of feet. Usually mild, starting 5-6 weeks after start of treatment. May require reductions in the dose of the medication. Numbness, tingling or pain in hands and feet. These side effects may occur in 30% of patients taking Nexavar. Some patients or their family members shared their experiences with Nexavar. This is a sad and pathetic story! Let’s start thinking a bit and ask some questions. Henry went to a TCM university hospital and he was prescribed pharmaceutical drugs. Does this sound right? Why do you need a TCM hospital then? Don’t you think the oncologists in a modern medicine hospitals are better trained and educated than those TCM professors or sinseh when it comes to prescribing pharmaceutical drugs? Personally I was really disappointed after hearing this story. When I started CA Care more than twenty years ago, I learned and read a lot about TCM from the Chinese. My experience showed me that the traditional wisdom of healing can help cancer patients. And up to this day, I know I am still not wrong! I would want to believe that those trained in TCM — in TCM university mind you — should be better and well placed to help cancer patients than me. To dish out chemo drugs to cancer patients is indeed a “betrayal” of sort. Hello TCM professors (I know that most TCM practitioners like to be called professors!) you can do better than that! Another disappointing thing is, even with TCM experts, they never teach patients that to get well patients need to take care of their diet and change their lifestyle. This is a real let down. What has gone wrong here? Sun Simioa, China’s great physician said, Only those who apply diet for treatment are superb physicians. Doctors should first understand the cause of disease, then treat it with diet. Medicine should only be used if diet fails. Indeed, you don’t have to be a TCM professor or scholar to understand this. 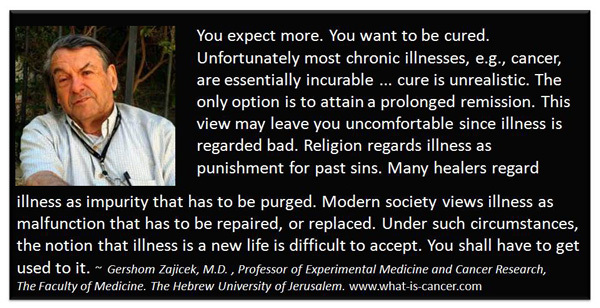 Even some oncologists in the Western world know this very well. From this great master of Chinese medicine, I learned about medical ethics, Sun Simiao was especially concerned about physicians being influenced by a desire for rewards, including financial rewards, fame, or favors granted to them: they should not have these as their goal. In the same note physicians should be honest — especially to their patients. So, do you think the TCM doctor gave Henry an honest advice? Take a look at the PET scan done in the TCM university hospital. His cancer is serious. His liver is badly damaged. And the cancer has spread to his lymph nodes and lungs. What is his chance of cure? Can we be honest about it? Let’s be honest professor, what do you think can be achieved by asking Henry to shallow Adefovir, Bicyclol and Sorafenib? I believe this TCM professor would be able to help Henry better if he is well armed with the real art and deep knowledge of TCM. There is no need to “ape” what the western doctors do. After looking at Henry’s PET scan and his blood test results — take note his alpha-fetoprotein was at 275,330 — I frankly told Henry no one on earth can ever “cure” him. He has to be realistic and know that his liver cancer is incurable. If he is able to live a quality life — can eat, can sleep, can move around and no pain — then be grateful and don’t ask for more. This I believe can be achieved with the proper guidance of TCM principle and use of TCM herbs. For the past twenty plus years, I have given terminally ill patients herbs and taught them to change their diet and lifestyle. The results were amazing. Let me end with this story …. A Tale of Two Patients: Alive and healthy — miraculous healing or fluke shot? LKS is a 63-year-old man. Eight years ago he was diagnosed with liver cancer and underwent a surgery. His gall bladder and part of his liver was removed. According to the surgeon there was no need for follow up chemo. There was no need to take medication either. LKS was well and went back to his normal life — of course, eating what likes. In late December 2017 (eight years after his surgery), LKS had wind in his abdomen and he had difficulty emptying his bowel. He went back to the same hospital where he had his surgery and did a CT scan. LKS was told there was fluid in his abdomen. He was prescribed some medication and sent home. He was told nothing else could be done. LKS and his family came to seek our help in mid January 2018. He presented with distended abdomen, otherwise he was alright. His liver function test done on 19 December 2017 was as below. LKS was prescribed liver herbs in addition to herbs for his abdominal distention. Within a week he felt better. Unfortunately this improvement did not last! LKS felt hungry and went to supermarket and bought some “instant food stuff” to eat. He was back to square one! Most patients never learn. In spite of us spending hours telling them to stick to healthy diet, they would sure go back to their “bad” diet the moment they feel well. This is my advice to all patients who come and see us. If you want to take our herbs, take care of your diet. If you want to eat anything you like, then don’t come and see us. 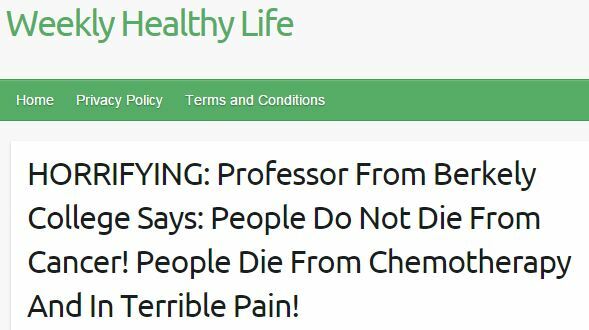 Yes, your doctors say you can eat you like or your diet has nothing to do with your cancer! 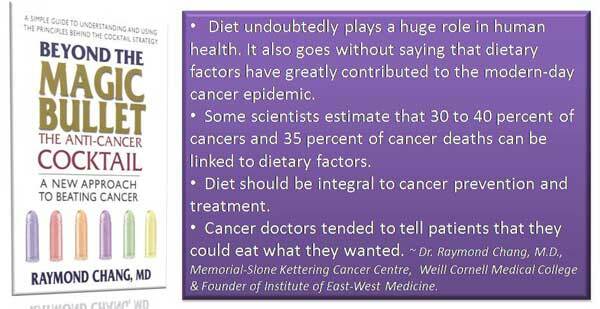 Our 20 plus years of experience tell us otherwise — diet plays a vital role in cancer healing! No need to listen to me. Read what other “enlightened” doctors have got to say. The take home message of this case is there for you to see! Surgery does not cure liver cancer. Yes, surgery can buy you some time. After surgery you may be told it is all “taken care off” or “I got the cancer all out”. Don’t be taken up by such assurance — I have seen enough cases of recurrence to tell you that such advice is misplaced and misguided. A misinformation. Desperate, Mei decided to go to the Philippines for immunotherapy-herbal treatment. A one-month stay and treatment in a “private hospital” cost AUD 4,500. Unfortunately, the treatment did not make Mei any better. After Mei returned to Australia she did an ultrasound which showed the tumour had increased in size. Mei and her husband was in a desperate situation having to face the possibility that Mei may die anytime soon. Mei did not want to give up hope. She started to surf the net and found a hospital in China which offers a special treatment. She wrote to the hospital and was told that she would need to undergo 3 to 4 treatments and each treatment cost AUD 20,000. Mei’s husband said they do not have the money to pay for such an expensive treatment but he was ready to go to the bank and ask for a loan to finance his wife’s treatment. Mei’s husband said that his wife did not know that all day and night and where ever has was — driving or in the toilet — he kept praying and praying, asking God for a sign of what to do to help his wife. Then, something wonderful happened! While he and Mei were reading the website of this Chinese hospital, CA Care’s website suddenly popped up. It was a video of a man with black hair (not white like now!) and he was talking. Mei and her husband read more about us, and according to Mei’s husband he was certain that God had answered his prayer. He told his wife, we must go and meet this man! Jab was a long-standing hepatitis B carrier. He was a rather conscientious person and went for regular medical check-up. Everything was okay. Then in May 2013, CT scan showed a 7 x 6 x 6 cm tumour in segment 7 of his liver, suspicious of HCC (primary liver cancer). His blood test showed low platelet count (124) but his liver function values were normal. His CEA, CA 125, CA19.9 CA 15.3 and PSA were all within normal range. Not satisfied, Jab went to Singapore and did MRI. The result confirmed a mass lesion in segment 7 and 6 measuring 6.2x 6.2 x 5.3 cm — consistent with the presence of a large hepatoma. Jab was still not satisfied and came to consult a doctor in Penang. He was prescribed BARACLUDE (entecavir), a drug commonly given to those with chronic hepatitis B. In addition, Jab was given medication for his heart. According to the doctors Jab had an option to undergo surgery to remove the tumour. In this procedure 45% of his liver would be cut off. However, Jab was told that the cancer would recur within 2 years after the surgery. The procedure would cost SGD 45, 000 if done in Singapore. If done in Penang, it would cost RM 45,000 (three times cheaper!). Jab refused surgery and came to seek our help and was started on liver herbs. He was doing fine. He looked fit and healthy. The only complaint he had was not being able to eat anything he liked! On 18 October 2015 — about two years later, we got an e-mail from Jab’s son. …. In April 2015, my father had decided to take up treatment in X Hospital in China. Some of the treatment are Interventional Therapy, Cryotherapy … in the last six months. His weight before treatment was 59 Kg, now 51 Kg. Even though I was against this idea of going to China for treatment, I respected his decision. Currently ascites developed in his body. The doctor … helped to drain the fluid, around 3.5 Litres. On 23 October 2015, Jab’s son came and told us this sad story. As my father has a very heavy ascites, from October until now already 4 times and the last 3 times are 6.5L, 6.5L and 4.5L (9 days from the third one). The last 3 times, the liquid has blood color. At this moment my father cannot walk and very slim, looks like left the skin covering the bones. His food only in the form of liquid, each time around 100 to 150 ml. Few times a day. Dr Chris, we truly believe God has plan for all of us but I still believe you can give me advise on what to do. I still can fly to Penang. My father still can sit with our support and very soft spoken but his brain is still in superb condition and he is a fighter as he keeps trying to live as long as he can. What can I do Dr. Chris? Any herbs can he take with his conditions? Reply: I have given you Ascites and Abdominal Distention teas — these are the only 2 teas I have …but if they are not effective, I really don’t know what else to do. As of today, the doctor installed silicone piping for my father for liquid consumption. My father has passed on. We want to thank you for your guidance during this time. We often tell patients, To die or to live and get well is your choice. So choose wisely! This is a sad story. Jab had to spend SGD 60,000 only to suffer and died. He never get what he wanted. But he made that choice himself, even against the advice of his three sons. This is a story with many lessons if we are willing to listen and learn! But, are patients prepared to learn? We are aware that what we are going to say here is not nice to hear. But for the sake of knowledge and also for the sake of those who want to learn, we are going to say it anyway. And we are going to say it as clearly as we can! No apology. Jab was with us for about two years and he was well, but this did not mean he was cured of his liver cancer. He led a normal, happy pain-free life. The only thing that he could not do was to eat anything he wanted! He had to abstain from “bad” food. 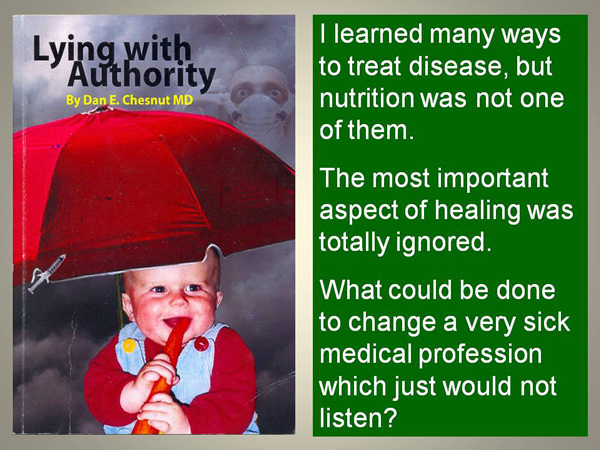 From our experience, we know that when patients are half-dead, they will abide by our advice, but the moment that they become well, more often than not, they will complain about their dietary restriction. They wanted to eat what they like. Jab was no exception. Like most cancer patients, when they became well food became their problem! To make things worse, patients probably are encouraged by relatives, friends and their doctors that they can eat anything they like — after all, they are already well or looked thin, etc. etc. With a 7 x 6 cm tumour in his liver, Jab ought to know that no one of earth can cure him. The three doctors that he consulted offered to cut off 45% of his liver. But this procedure was not going to cure him — he was told than the cancer can recur within two years. Two years is already a blessing, if indeed what is said is true! We have seen patients suffered recurrence or even died only months after surgery. We understand, Jab was a conscientious person. We wanted the best for himself. He wanted a find cure for his incurable cancer. 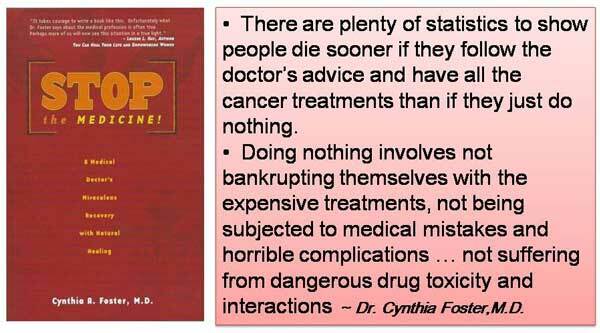 Unfortunately cancer treatment is more dangerous than going to a casino. In the casino at worse, you lose everything in your pocket. In cancer treatment, you not only lose your entire life’s saving but also your life! It is indeed hard to convince patients to be contented and be happy with what they have or what they are. They always want more and more. All patients who come to us, expect us to cure them! They ask for the impossible. Listen to the advice of this professor. In cancer healing, we have to learn to be grateful for what we are and what we have. This is probably the only way we can stay happy from day to day. Cultivate gratitude, not greed! It is hard to make patients understand this. To most of them, it has to be fight and fight all the way to the grave. No, at CA Care we never tell you to fight — we tell you to learn how to live with your cancer! We ask you to tell you cancer, If I die, you will die too. So let’s have a win-win situation. You live in there but don’t disturb me and we all live together happily. Of course, many people may think we are talking “rubbish”. May be true, but what other option do you have? 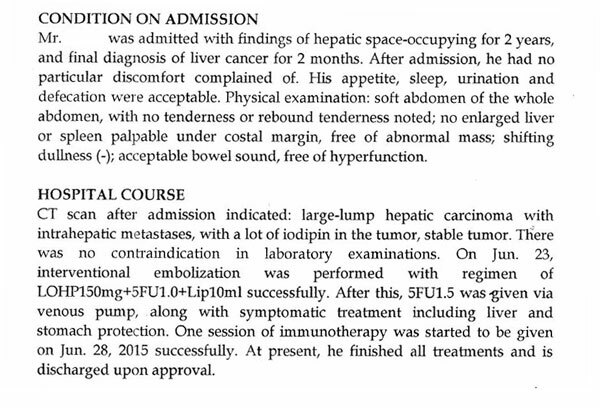 Cancer Recurred After Liver Surgery: The same story again and again! In the past few weeks, three liver cancer patients came to seek our help. These are their stories and we hope readers and patients can learn from their tragic experiences. Patient is a 66-year-old man from Singapore. He did not have any symptoms. His liver function was normal but a CT scan in September 2014, showed he had liver problems. Patient was referred to a liver specialist in a government hospital. MRI was done and on 26 February 2015, patient underwent a laparoscopic liver resection of segments 5, 6, 7 and 8 of his liver. At the same time, he also had a cholecystectomy (removal of gallbladder). Histopathology report confirmed a hepatoceullular carcinoma (HCC). 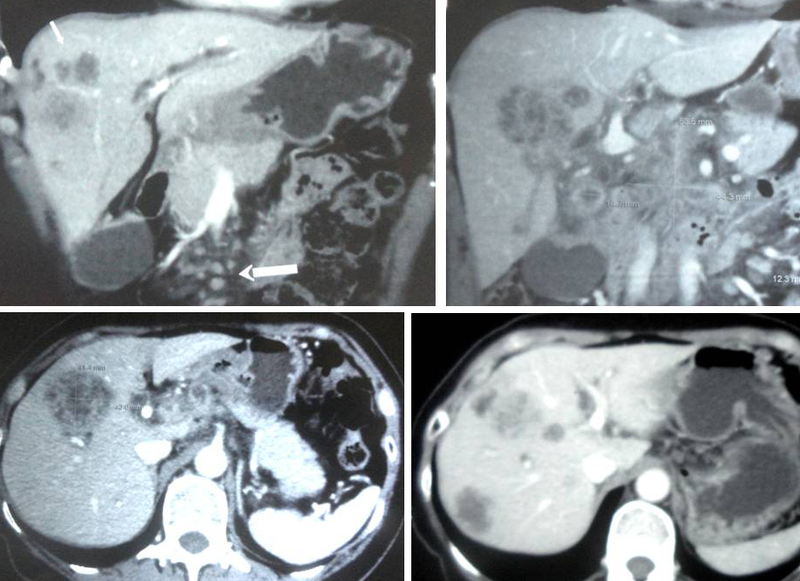 Five months later, 14 July 2015, MRI showed new foci of the HCC seen in segments 7 and 2/3 of the liver. The cancer had recurred. In August 2015, patient underwent a second liver surgery. This time it was a wedge resection of segments 6 and 7 of his liver. At the same time FRA (radiofrequency ablation) was performed onthe tumour in segment 2/3. Patient was told another surgery was not an option anymore. He could go for TACE (transarterial chemoembolization) or a liver transplant. Patient and his son came to seek our opinion. We told the patient: “If you come here expecting us to cure you, then we are sorry to say that we have no magic bullet to cure you!” Patient went home disappointed. Patient is a 73-year-old Malaysian. Sometime in December 2014, he had jaundice. A CT scan showed his liver was really bad. On 29 January 2015 patient underwent surgery in a government hospital. His gallbladder was removed. Segment 3, 4B and left lateral section of his liver were also removed. Histopathology report confirmed hepatocellular carcinoma (HCC) with foci of angioinvasion. Two months later, March 2015, a CT scan showed a few spots in his liver. The doctor suspected recurrence. Patient was referred to a private hospital in Penang and was offered to participate in Phase 3 Clinical Trial — Selective Internal Radiation Therapy (SIRT) versus Sorafenib. Sorafenib (also known as Nexavar) is a so called targeted oral chemo drug. Normally it cost RM 15,000 to 20,000 per month. The SIRT (radiation) would normally cost RM 50,000. Can the above treatments cure patients? This patient was told it would just prolong life. Prolong for how long? No one does not seem to know! Patient was also told that he “qualifies” to participate in this clinical trial, Nexavar would be provided to him for free but he was pre-warned about the following side effects of Nexavar. Patient is a 67-year-old Malaysian. On 16 December 2014, he had biliary sepsis (infection of the bile duct which is generally followed by obstruction of the bile duct). 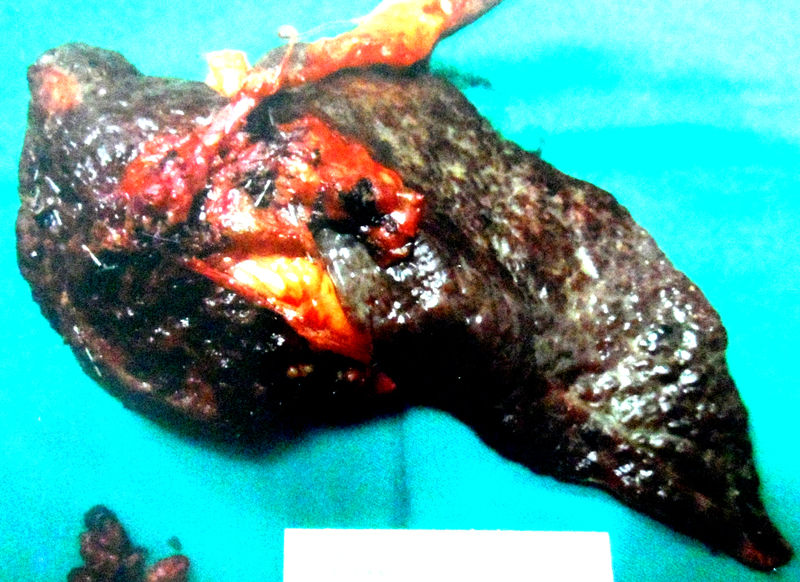 A biliary sphincterotomy was performed (Sphincterotomy is a complex procedure…. involves deep cannulation of the bile duct followed by severance of the sphincter of Oddi with the electrocautery). Unfortunately, his problem persisted. On 29 January 2015, his blood test returned the following results. A CT scan on 20 February 2015, showed an ill-defined hypodense lesion in the left lobe of the liver and para-aortic lymphadenopathy. 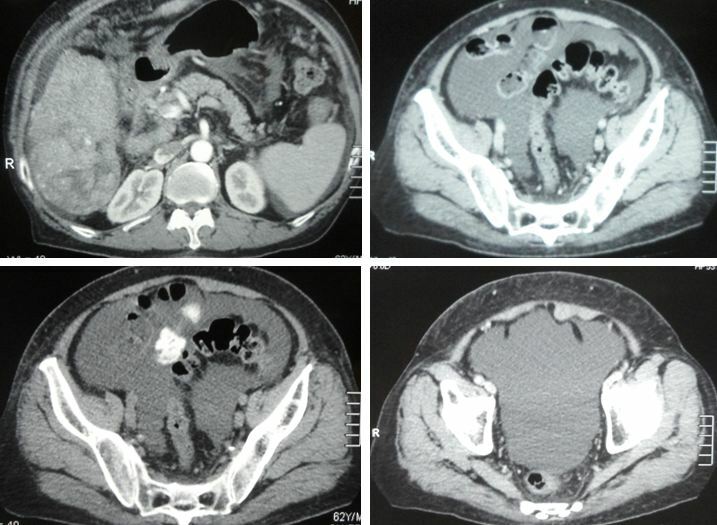 Findings are suggestive of cholangocarcinoma (bile duct cancer) and bile duct obstruction. Blood test on 23 February 2015 showed his condition had deteriorated. On 23 February 2015, patient underwent another operation — a left hemihepatectomy and radical choledochectomy (removal of a portion of the common bile duct). Everything seemed to work well for a while. Patient returned to his surgeon for routine check-up every 3 months. Unfortunately, 9 months later, the cancer started to recur in his liver again. A CT scan on 7 December 2015 stated: There are “at least 9 low attenuation lesions in the right lobe of the liver, largest at anterior segment 8 measuring 4.1 x 3.8 cm. These could be due to recurrent tumour and metastases. Patient spent RM 74,910 (covered by medical insurance) for the above failed treatment. SIRT (Selective Internal Radiation Therapy). While flying from Penang to Singapore, the patient’s daughter was seated next to an Indonesian lady who is our patient. During their casual conversation, the patient’s daughter came to know about CA Care. As a result, father and daughter came to seek our help and decided not to pursue further medical treatment. 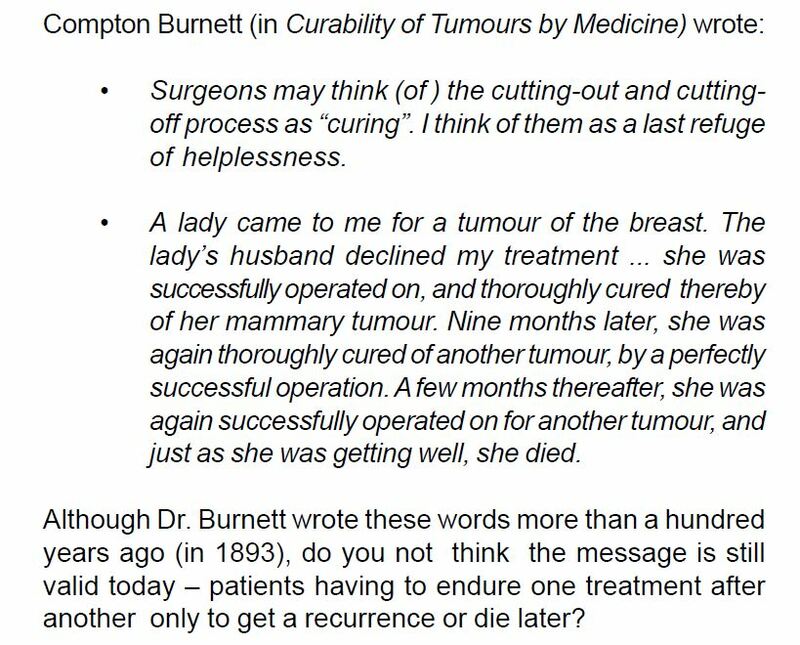 Surgical resection offers the only chance for cure; however, few patients have a resectable tumour at the time of presentation. Randomized trials have NOT shown a survival advantage after chemoembolization. The liver cannot tolerate high doses of radiation. The disease is not responsive to chemotherapy. If there is a tumour in the liver, the answer is probably “CUT it out”. But take note that cutting does not necessarily cure your cancer because in the first place it is not suitable for cutting — it could be too big in size or the cancer has already spread too extensively. But cutting seems to be the only sensible option. And many patients, like the above cases, have gone through it. Disaster. One important aspect of liver surgery which you should know is that, as in the above cases, the cancer can come back again 3 to 9 months after an apparently “successful surgery.” Patient No: 2 spent RM 75,000 for the operation and 9 months later, 9 new lesions were found in his liver. After surgery has failed, patients are offered the next “useless” line of defence — Go for TACE, i.e. chemoembolization, radiation or chemotherapy. The above medical textbook says, all these are not effective. SS (s-406) is a 61-year-old Indonesian. Sometime in 2011, he had to be hospitalized. Something was wrong. Fluid accumulated in his abdomen and this had to be tapped out. In 2012, he landed in the hospital again, twice. In February 2013, he again had to go into the hospital to have fluid tapped out of his abdomen. In July 2013, SS came to seek our help. Since then, he need not go to the hospital anymore! What was wrong with SS? An utrasound on 16 May 2013 showed a 8.9 x 6.6 cm mass in his pancreas. And he had fatty liver. ascites (accumulation of fluid –usually serous fluid which is a pale yellow and clear fluid — in the abdominal (peritoneal) cavity. Ascitic fluid can have many sources such asliver disease, cancers, congestive heart failure, or kidney failure). 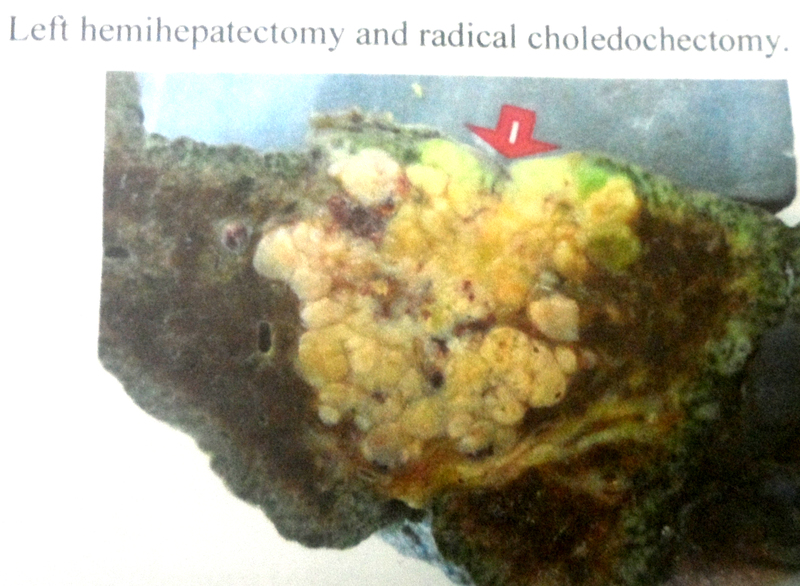 cholecystitis (inflammation of the gallbladder). The report said: tidak terlihat nodul /massa atau lesi fokal (no nodule or mass seen). 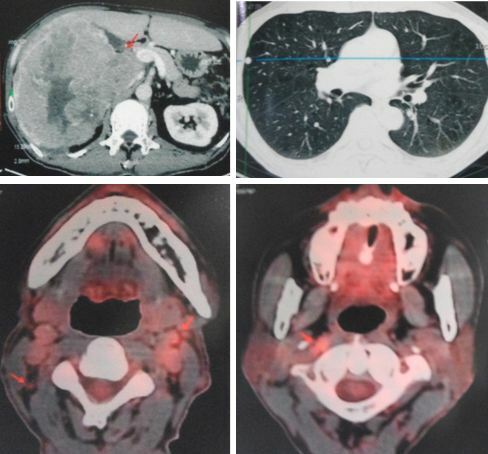 So, how can we make out of this case with two conflicting imaging reports? SS was prescribed herbs for his liver and pancreas and was told to keep to a healthy diet. Listen to the video clips below. April 2014: Almost a year on CA Care Therapy, SS said he was far better off than before! September 2015: According to his niece, SS is doing find fine up to this day. Since on CA Care Therapy he need not have to go back to the hospital anymore. SS had just came back from a holiday in Bali. Chris: Thank God for this! Jack (not real name) is a 69-year-old Indonesian. Some 20 years ago, he was told he had hepatitis B. For all these years he did nothing about it. And he did not have any symptom. In May 2013, he went to a private hospital in Melaka for a checkup. Blood test — tumour markers and liver function enzymes — were all within normal range, except for a slightly low platelet count. Ultrasound of upper abdomen showed a heterogenous solid lesion in segment 7 measuring 5.7 x 6.8 cm. There are multiple cysts in both lobes of liver measuring 7 to 12 mm in size. 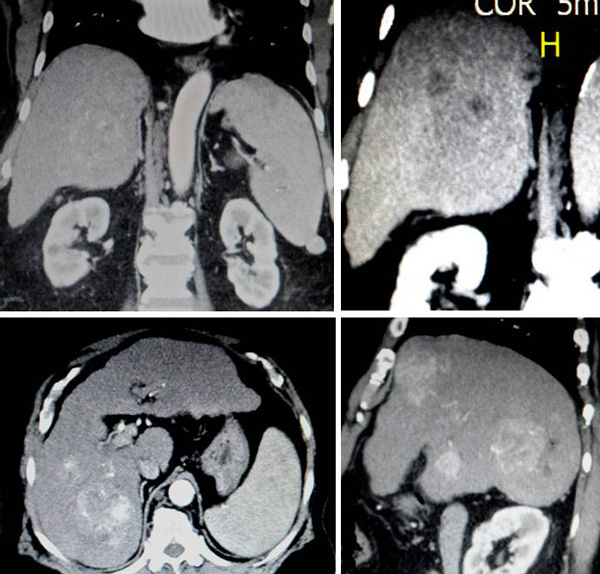 Multiple cysts in left kidney, largest 2.9 x 4.9 cm and a large right renal cyst, 8.4 x 10.1 cm. CT scan of abdomen confirmed a 7 x 6 x 6 cm tumour in segment 7 of liver. This is suspicious of HCC (liver cancer). Not satisfied, Jack went to Singapore for second opinion. MRI on 4 June 2013 confirmed the presence of a large enhancing mass lesion in segment 7 and 6, measuring 6.2 x 6.2 x 5.3 cm. The right kidney cyst was 10.3 x 6.8 cm in size. There was no MRI evidence of extrahepatic metastatic disease. Jack came back to Penang again. Blood test done in a private hospital on 12 June 2013, showed everything was normal. Two days later, he and his family came to seek our help. Listen to our conversation that day. Chris: You have consulted three doctors. What did they ask you to do? Son: All the three doctors suggested surgery, remove 45 percent of the liver. C: Did you ask if doing this can cure? S: There is a high chance that the cancer would recur after 2 years. C: How much is it going to cost you? S: If done in Singapore it is SGD 45,000. If in Malaysia it is RM 45,000. C: So, what do you want to do? Go for surgery? Patient: If possible, I want to avoid that. Dear Dr. Chris: My father shows no sign of pain and has good appetite. He lost a lot weight but has since maintained at around 59 kg. Apparently last month he went for USG on his own without us knowing. The result showed slight increase in the size of the tumor. One month later, May 2014, Jack and his son came to our centre. P: Fine, except that the food is not delicious. Because I cannot eat meat. C: Okay, you can go home and die! 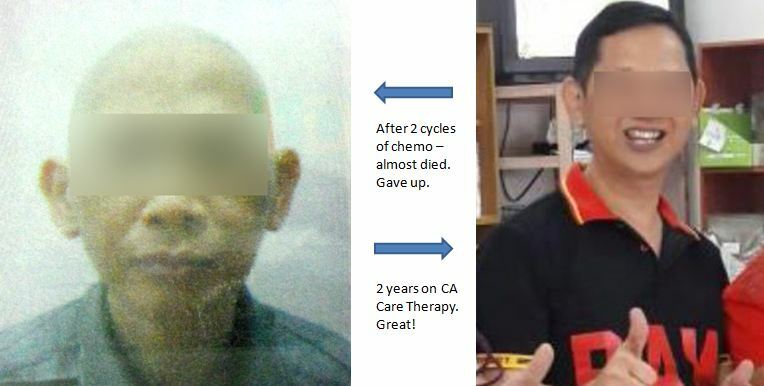 Listen to this story: https://cancercaremalaysia.com/2011/12/24/liver-cancer-better-to-become-a-full-stomach-ghost-than-a-hungry-ghost/ This patient who was medically given up told us that he would like to eat what he liked because he did not want to die with an empty stomach and turned into a hungry ghost! One year 8 months later, he died. P: I am growing thinner. C: Why do you want to grow fat? You are not a pig or a cow — to be sold by the kilos. Being alive and healthy, with no pain, can eat, can walk, can sleep — what else do you want? Unfortunately, most patients are like Jack. When they feel well — the first problem they encounter is their diet. Cannot eat this, cannot eat that. This is the most common complaint! Not long ago, I received an email from the daughter of a patient with medically-given-up pancreatic-liver cancer. She wrote: Doctor, my father getting fed up eating food without oil. Is it ok if we use small amount of oil or ghee to cook his food? To that, I replied: Let him die if that is what he wants. Go eat what he likes and see what happens. I am not god to give patients permission to eat this or eat that. I am telling you, if you eat bad food you die. As simple as that. Apart from the diet, another problem facing patients like Jack is the sheer ignorance or the lack of wanting to know the reality of their illness. Three doctors have told Jack that 45 percent of his liver had to be cut off. Does that not sound serious to you? Spend SGD 45,000 or RM 45,000 (take your choice) but within two years, the cancer is expected to come back! Giving you two years is rather generous indeed! You could be dead after the surgery! And this story — the mother of all disasters, A Great Failure and Let Down. Sam was operated on in October 2008 and by April 2009 he was dead. That was just six months after his liver surgery. Apart from the sad experiences above, here are what the experts said about liver cancer, like the one that Jack has. A total of 850 patients with hepatocellular carcinoma were seen during the last 8 years. The median survival of 229 patients who received no specific treatment was 1.6 months — 0.7 month for Stage 3 patients, 2.0 months for Stage 2, and 8.3 months for Stage I. For the above data, it is clear that patients with HCC or liver cancer would not be able to survive long — average 6. When Jack came back to see us ONE year later, he was well — only on herbs and change of diet, without any medical drugs. What was not well with him was his dissatisfaction of not being able to eat what he likes — our suggested diet was not delicious enough! We have many liver cancer patients who are like Jack. They were on our therapy and lived much longer than 6 months. That is if they take care of their diet. Liver Cancer: Two months to live yet still fine after one and a half years! Only On Herbs And She Lives More Than Five Years! So, to patients like Jack we ask: Being alive and healthy, with no pain, can eat, can walk, can sleep — what else do you want? Unfortunately, we know that some patients, even if they are getting better, they do not have a sense of gratitude — to appreciate and be grateful for what they are blessed with. They demanded more — they wanted a total cure! They wanted to eat what they like. They want to go back to their old way of life. Jack’s story did not end yet. After two years of being alive and healthy, he courted disaster! In October 2015, we received an e-mail from Jack’s son. In April 2015, my father had decided to take up treatment in X Hospital, China. Some of the treatments are interventional embolism therapy, cryoablation therapy — in the last six months. His weight before treatment was 59 kg, now 51 kg. Even though I was against this idea of going to China for treatment, I respected his decision. Currently, he developed ascites in his body. The doctor helped to drain the fluid, around 3.5 litres. From your website, I understand that you have herbs for ascites. Could you prescribe for my father? Interventional embolization with LOHP + 5FU + Lip. He was given Genoderma lucidum (Linzhi) capsules to take on discharge. Jack’s son came to Penang and sought our help again. Listen to what Jack’s son had got to say that day. Chris: Your father. Already two years. How is he now? Son: As I mentioned in my e-mail. Six months ago he decided to go to China. C: What did they do to him there? S: Interventional embolization, immunotherapy and cryo-therapy! C: Wah, how many times did you go there and how much did it cost you? S: Three times, costing about SDG 60,000. C: Why did he want to go to China? S: Before going there, we had a family discussion. I told my family. Dr. Chris is not a saint but what he said is very logical. It is about quality of life. I told my father, perhaps after you got to China may end up worse off. It turned out to be true. There are four of us, and three of my brothers were against him going to China. C: There is this man from Medan. He too went to China (same hospital). He spent almost IDR 3 billion! And he did not find any cure — became worse. I asked him: Why do you come and see me? He replied: I have no more money! This man also told me that he know about CA Care even before he went to China but he did not want to come here because he did not want to follow our recommended diet. So I asked: Now you are here, do you want to follow our diet? He said yes. I told him if you want to eat what you like, you better leave. I cannot help you. S: My father said Dr. Chris’ herbs cannot block the growth of the tumour. But I told him you only follow 90 percent of his recommended diet. Cannot. C: Yesterday, one patient with liver cancer was here. He was told he had only 9 months. Now with the herbs and proper diet, he is still alive and healthy after one year! He can play golf and walk long distance. Then he told me a friend sent him a video which said he must not eat rice but eat a lot of meat and eggs instead. I told him, Okay, go home and eat these. Be prepared to die after one month! S: When we were in China, the doctor there also said it is not right NOT to eat meat and eggs. I didn’t want to argue with the doctor because I was not able to speak Chinese. Two weeks ago, my father’s stomach was bloated with fluid inside. We had to go to the doctor (in our hometown) to tap it out. But the doctor said the fluid can come back again. C: Before going to China, did you ask if the treatments they are going to give, is going to cure your father’s liver cancer? S: They cannot! I already told my father. In the website they never ever mentioned cure. They only say they may be able to extend his life. I said told my father, Dr. Chris already extended your life for 2 years, what else do you want! C; That is what I mean by people not being thankful. They do not acknowledge and thank God for what is good. They only want what they want. This is the problem with many cancer patients. Okay, you went to China many times. Did your father get better and better — after spending all that money? S: Weaker …. one time my father asked the doctor why after coming here (China) he became weaker. The doctor did not answer! C: Does he know that he is not getting better? S: Now he knows he is not good! In summary, for patients who come to seek our help, we would like to tell you these once again — frankly and bluntly. Read and Learn. Know what your cancer is all about. Know what you are up against. Don’t depend entirely on others to tell you what t do. Learn and heal yourself. Know that there is no cure for cancer but you can find healing. If you don’t want to read or know, you may end up being a “dead duck”! Be grateful for what you are each day. To be able to live — free of pain, being able to eat, sleep and move around, etc. Thank God for each day that you have. But if you are always asking for the impossible, you will never be able to be happy and satisfied. You will never find healing with such an “ungrateful” attitude. To heal, you need to accept the hard reality that you MUST change — change your attitude about life, change your lifestyle and change your diet. Know that your health is your responsibility. Others around you may be able to help but they cannot cure you. You need to help yourself and heal yourself. And make no mistake, you cannot find healing on your own terms. Ben (not real name), 65-year-old Indonesian, first came to see us in 2013. This is what was written in his medical report dated 13 August 2013. The above named gentleman first came to see me at Z Hospital on 12 August 2013 with a presenting history of abnormal liver enzymes. Of note, he is a known case of chronic hepatitis C infection (since 2000), diabetes mellitus, hypertension, hyperlipidaemia, old stroke and post cholecystectomy. He also has allergy to penicillin. Laboratory investigations, ultrasound abdomen and CT scan abdomen were done for further evaluation. Finding suggestive of liver cirrhosis, associated with multicentric hepatoma. The large mass in right lobe liver is 8.4 x 7.2 cm. There are also multiple smaller nodular lesions in right lobe liver, which are about 1.0 cm to 2.0 cm. A calcification in right lobe liver. The spleen is enlarged, 14.5 cm. Multiple enhancing masses seen at the liver. The largest one measures 6.9 cm x 7.4 cm. Liver cirrhosis with portal hypertension. 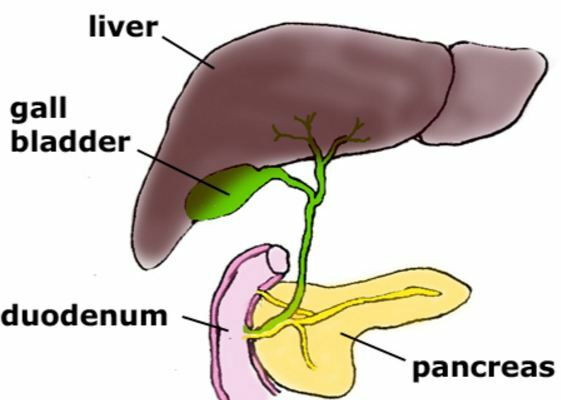 The spleen is enlarged measuring 14.8 cm. Small right renal cyst, 0.9 cm x 1.5 cm. Prostate is enlarged measuring 4.9 cm x 6.1 cm with no focal lesion seen. 1) Chronic hepatitis C infection with chronic active hepatitis, liver cirrhosis and portal hypertension (splenomegaly, thrombocytopenia and trasaminitis). I have advised him to seek early treatment from Consultant Oncologist in view of further treatment of his multi-centric hepatomas (i.e. TACE or RFA). Liver transplantation would be impossible due to his age. Liver surgery may be an option. He needed to undergo chemotherapy. Ben refused further medical treatment and came to seek our help. Ben came to see again in late April 2015, one year seven months later. He had gone to see his doctor and did a CT scan. There are multiple enhancing masses seen at the right lobe of the liver. The largest one measures 10.5 cm x 15.4 cm seen at segment 6 of the liver. There are two small calcifications seen at the left lobe of liver. Spleen is enlarged with greatest diameter measures 14.5 cm. Prostate is slightly enlarged with greatest diameter measures 4.3 cm x 6.2 cm. Ben: When I saw my doctor yesterday, he shook hands with me twice! Wife said: The doctor commented, “You are still around?” (implying that Ben should have been dead by now). According to the doctor, among his patients, in cases like this, the longest survival time was only 9 months. B: Generally by 3 to 6 months they were gone. When I first saw him almost 2 years ago, I was given only two months to live. Chris: Does he know what you are doing. B: I told him I am on herbs. C: Was he angry because you were taking herbs? C: Yes, at CA Care we see miracles every week! This is NOT something unusual. Thank God for this blessing. Almost two years now, Ben is still alive and well. Why? He was entirely on the herbs — no chemo at all (that was the only option he had). What does that tell you? Herbs are not proven? Hocus pocus? What about those who did medical treatment? Maximum of 9 months and they were dead? Even from Ben’s own experience, his many friends were gone after medical treatment. Ben told us he has a doctor friend (trained in Germany) who was very impressed with his progress. The doctor even asked for CA Care’s address! Sometimes, we tend to think that people who go for herbs and forsake scientific medical treatments are dumb fools, deficient in knowledge and uneducated. NO, that is a wrong presumption! Generally those who come to CA Care are well educated people. Like the case of Ben, he was once the President of a university! He knew what he was going into. Have a new liver anyone? In July 2014, two patients came to seek our help. Patient One is 63 years old. Patient Two is 51 years old. Both are Indonesian males. They knew each other while staying in a hospital in China. Both had liver cancer and they went to China to undergo a liver transplantation procedure. Unfortunately both did not find a cure after spending RMB 1 million (per person) for their treatment. Both came to us after their cancer recurred. Patient One: He had hepatitis about 15 years ago. In 2010, he was diagnosed with liver cancer. He went to Singapore and had TACE (Transcatheter arterial chemoembolization). Unfortunately the treatment did not help him. In 2012, he underwent a liver transplantation in China. He waited for a month to get a donor. In total, Patient One stayed in the hospital for 90 days. The procedure cost him RMB 1 million. As a follow-up, he was given immune suppressing drugs, not chemotherapy or radiotherapy. Patient One was well for about 6 months. Unfortunately, on his third follow-up in October 2013, he was told the cancer had spread to his lungs. Patient One went to Singapore for help and was prescribed Sorafenat (a genetic Sorafenib or Nexavar). He was on this drug for about 6 months. In the first month on Sorafenat, he had blisters on his head. In February 2014, Patient One came to Penang for more opinion. He was again told by the doctor to take Nexavar and at the same time do a biopsy. He refused. Patient One came to seek our help in July 2014. Patient Two: He was told that he had hepatitis B in 1985. He received about 100 injections of interferon every 3 weeks. Unfortunately, the treatment failed. By 2011, his hepatitis developed into liver cirrhosis and full blown cancer. He underwent TACE and RFA (radiofrequency ablation) in Singapore. Both treatments failed. Patient Two went to China in March 2012 and underwent a liver transplantation procedure. He stayed in the Chinese hospital for 90 days. In November 2013, on follow-up, Patient Two was told everything was fine. But in January 2014, his alpha-fetoprotein started to increase and was 49.9. Follow up CT/MRI/PET scan in Singapore showed a tumour in his liver and another tumour near his heart. In short, his cancer had recurred and even spread to his heart. In February 2014, he underwent RFA again for his liver lesion. In May 2014, he underwent a surgery to remove the tumour on the surface of his heart. In July 2014, CT scan revealed 2 new lesions in his liver and the tumour near the heart had infiltrated into the heart muscle. His alfa-fetoprotein had increased from 49.9 to 110 plus and then to 159.6. In August 2014, it was at 161.5. The doctor told Patient Two that he could not do anything more. On his own initiative Patient Two continued to take these drugs: Prograf, Everolimus, Baraclude and the generic Nexavar from India. After taking the Indian “Nexavar” for 2 months he had diarrhoea and his skin peeled. Patient Two started to take herbal teas and herbal tablets. He also tried the “Terapi Rompi” for 5 months. In July 2014, he came to Penang to seek our help. We made a google search using this phase, liver transplantation survival rate. Here are some of the results. For patients with hepatitis C, recurrence of the hepatitis causing damage to the new liver is the most common reason for the new liver to fail. This can happen over many years, but in rare cases, it can also occur within the first few months. Patients withliver cancer can experience recurrence of the cancer after transplant, even if the initial cancer was small. Small tumors (micrometastases) may be present outside the liver at the time of transplant that are not visible on imaging tests. These can grow and cause symptoms later. Fortunately, recurrence is uncommon after transplantation (there is about a 30 percent risk of recurrence) if patients have early-stage liver cancer (Stage I or II). Who Are Not Candidates for a Liver Transplant? Not all liver cancers can be treated by liver transplantation. Only small, early tumours have an acceptable chance at success. Liver transplantation is not suitable for everyone, so all potential transplant patients must be carefully assessed. We started to refine our search to: liver cancer and liver transplantation success rate. The rosy statistics started to become more bleak and blur! The numbers below come from the National Cancer Institute’s Surveillance, Epidemiology, and End Results (SEER) database, and are based on patients who were diagnosed with liver cancer (hepatocellular type) between 2003 and 2009. Dr Vinay Kumaran, Head of the Liver Transplantation and Hepatobiliary and Pancreatic Surgery at the Kokilaben Dhirubhai Ambani Hospital, Mumbai tells us all about liver transplants. Are there many cases where a transplant cannot be done even if a patient needs one? A transplant cannot be done unless there is a donor. In most cases there is a living donor from the family who volunteers to undergo an operation to remove part of the liver which is transplanted into the patient. Occasionally, the family of a brain dead patient agrees to donate the organs but this is quite rare. Can liver be taken from cadavers too like the eyes? Yes, in a very specific situation. The cadaver should be a person who has died of brain damage (head injury, stroke, etc) and is on a ventilator at the time of death. The heart continues to beat for some time after brain death and we can continue to ventilate the lungs and give medicines to maintain blood pressure and nutrition. As long as adequate blood flow and oxygen delivery can be maintained to the other organs of the cadaver, they can be removed and transplanted with the permission of the next of kin. What is the rate of success of a liver transplant? A liver transplant can be said to be successful when the patient returns to a normal productive life. The success rate is about 85-90% at one year after transplant and about 75% 5 years after transplant. Some patients will have a recurrence of their disease, side effects of the medicines, complications of the transplant etc. hence the difference. What are the side/after effects of getting a liver transplant? What is the rate of rejection? The patient has to be on medicines to prevent rejection for the rest of their life. This increases somewhat their risk of getting infections and such infections have to be recognized and treated. There is also a higher than usual risk of cancer over their lifetimes, predominantly skin cancers. The medicines have side effects including a risk of kidney problems, diabetes and blood pressure over the years at a higher rate than the normal populations. In general, the life of a liver transplant patient is similar to that of a patient with a chronic but controllable medical condition like high blood pressure in that periodic (once in 3 months long term) checkups and adjustment of medication is required. Episodes of rejection occur in 10 to 30% of patients who have undergone a liver transplant. Patient One told us, “I had to sell one house to pay for my medical bills.” We asked him, “Did you ever ask the doctor if the liver transplantation would cure your cancer?” No, he did not ask that most important question! By sharing this story with you, it is our hope that patients can learn some lessons from the experiences of others. You need not have to travel the same road that they did! 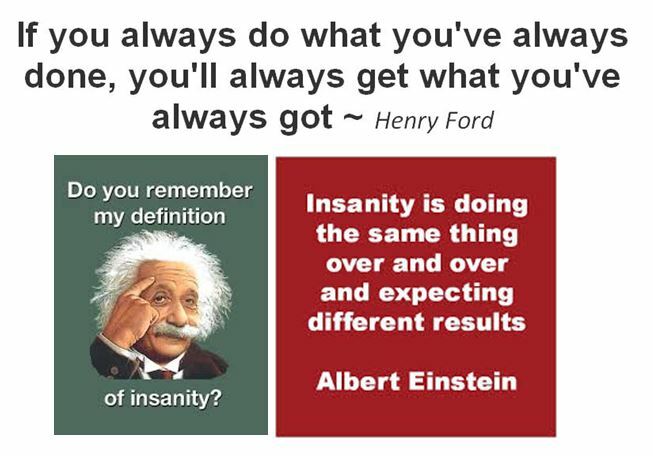 So, Lesson One: Patients, know what you are doing – ask where you are going? What are your chances? You don’t want to do things just to end up being a looser later. Lesson Two, don’t be misled by deceptive sweet statistics. Read a bit more and learn. When we started reading, it was great to know that survival of liver transplant patients could be up to 80 to 90 percent! Fantastic! But hang on, is that for patients with liver cancer? According to the SEER database, survival for those with distant metastasis is only 2 percent! So ask, is liver transplantation suitable for you? Lesson Three: Your chance of success is only good if you have early stage liver cancer – which has not spread anywhere. In the above two cases, what do you think are their chances? If you were one of them, would you go for a liver transplant? Beware and reflect on these quotations. About a year ago, we documented the story of AS in our posting, Liver Cancer: 3 cm Tumour OUT, 8 cm Tumour IN After 9 Months and S$28,000-Surgery. Briefly these were what happened to AS. He underwent a cholecystectomy on 31 December 2011 in Indonesia due to gallstones. During the open surgery the surgeon also did a liver biopsy for suspicious liver lesions. AS went to Singapore for a second opinion. A review of his biopsy tissues showed poorly differentiated liver tumour. AS subsequently underwent a liver surgery in Singapore. 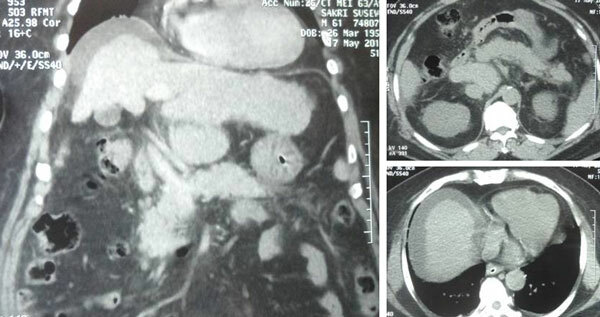 CT scan on 16 August 2012 showed no evidence of recurrent HCC. 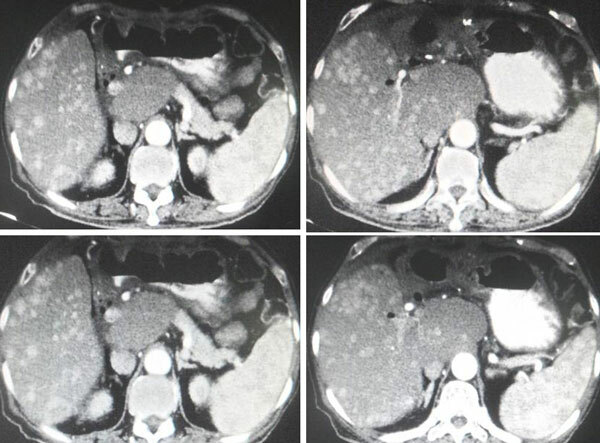 However, PET/SC scan on 11 March 2013 revealed recurrent HCC with mass measuring 0 x 4.8 cm. Trans-arterial chemoembolization (TACE) of the liver tumour was attempted but failed. With no other option left, the doctor suggested chemotherapy or Nexavar. AS promptly rejected chemo and came to seek our help on 14 April 2013. His alpha feto-protein on 15 April 2013 was at 1,064. Video 1: Liver tumour: Surgery and TACE failed. The question we all wish to ask is, What happened to AS after taking the herbs? The answer is, He is well and very much alive. 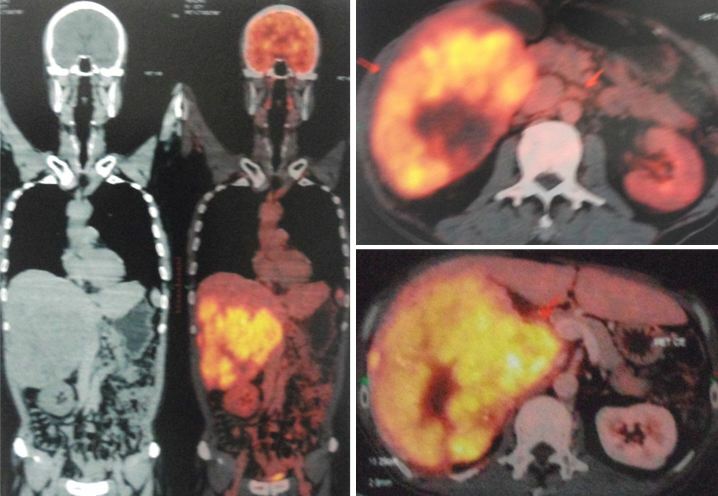 CT in December 2013 (8 months after taking herbs) indicated the tumour had shrunk to 5.2 x 2.2 x 3.9 cm in size. About 2 years later, 18 January 2015, AS and his wife came to visit us. AS’s wife was very agitated and upset. Since the past few weeks AS had been taking “bad food” – food that we tell patients not to eat. On top of that AS sometimes was not taking the herbs as he used to do. Video 2: To live or to die is your choice! My experiences have shown that if a patient eats anything he/she likes, this “good time” would probably last about 2 months. After that the cancer would recur and he/she cannot “enjoy” food anymore. I wish to state too that telling AS the above was not done with anger! I have learned a lesson from one of our patients earlier on. His argument for wanting to eat anything he likes is because he does not want to go hungry. After all he is going to die anyway, so why go hungry and die with an empty stomach? He would probably become a hungry ghost! (Click this: Liver Cancer: Better to become a full-stomach ghost than a hungry ghost). I am equally glad that AS took the message sportingly. He was not upset and only smiled. So let us respect his choice! Study the data below critically and then try to reflect on the questions posed. 2 February 2012 Post-cholecystectomy. Left hepatic lobe tumour, 3.2 x 2.6 cm. 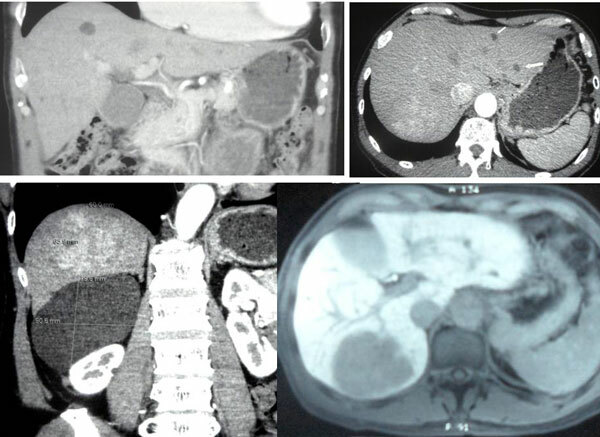 16 August 2012 THREE MONTHS: CT abdomen/pelvis showed no evidence of recurrent HCC or focal liver lesions. 11 March 2013 TEN MONTHS: Interval development of an intensively hypermetabolic measuring 8.0 x 4.8 cm at the hepatic resection site consistent with recurrent disease. 26 December 2013 EIGHT MONTHS ON HERBS: CT done in Jakarta: Hepar: Tampak lesi dengan enhance minimal ukuran 5.2 x 2.2. 3.9 cm disekitar klip lobektomi. Dibandingkan dengan CT scan Mei 2013 tampak menencil secara signifikan.Liver lesion is 5.2×2.2×3.9 cm. 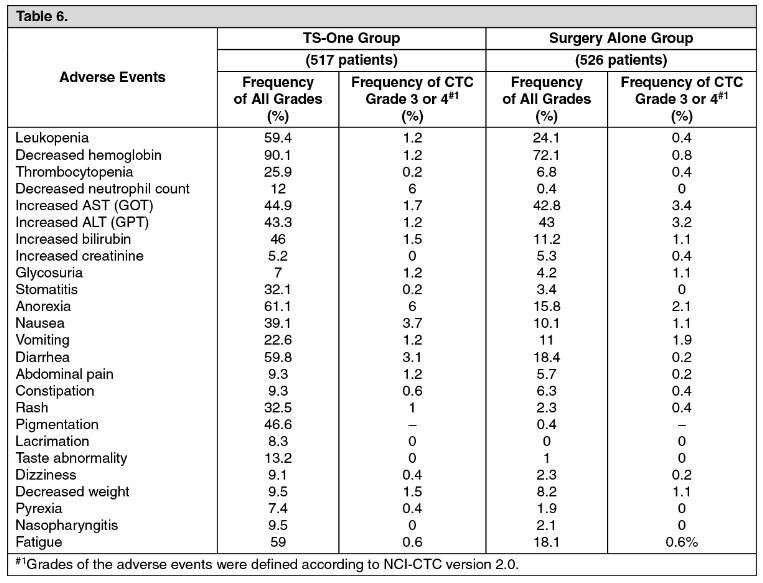 Compared to CT scan of May 2013, significant decrease in tumour size. 18 January 2015 Almost TWO YEARS ON HERBS: Patient still well and healthy. Can surgery cure liver cancer? In this case, the answer is plain and simple. Surgery cannot cure liver cancer. For the initial 3 months, there was reason to be happy because CT showed no recurrence. The operation was a great success! But this success lasted only a few more months. The cancer came back. Is this not expected — a norm? Before surgery the tumour was only 3.2 cm. After surgery it grew to 8.0 cm. TACE was attempted and failed. The doctor suggested chemotherapy or taking of Nexavar. AS rejected further medical treatment. He and his family came to CA Care instead. He was started on herbs. What can you expect if you do nothing (medically) after that? At best within 3 or 6 months AS would be dead. That is what the medical literature would tell you. AS did not go for any more medical treatment. He said he had lost confidence in the doctors who failed him twice. He only took herbs and changed his diet according to our advice. It has been almost 2 years now. He is still alive and well – leading a normal, pain-free life. Herbs are said to be “unproven and unscientific.” What say you now? Or is this recovery merely due to “pure luck” (another favourite medical argument)? Or is this recovery merely due to luck – yet another favourite medical explanation!